This semester in 1st grade homeschool we are having health class twice a week. We are using (and loving) Horizon Health for 1st grade. Though it is optional for this curriculum, this health class utilizes sock puppets as a teaching aide. 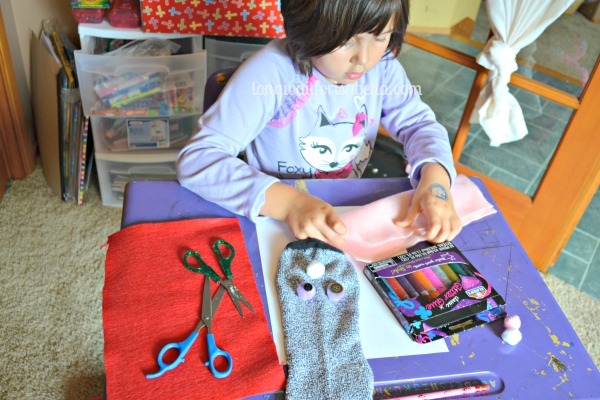 I’ve decided that my Princess and I would make our own sock puppets to interact with during health class. It is a fun way to teach and learn and she is beyond excited about it. 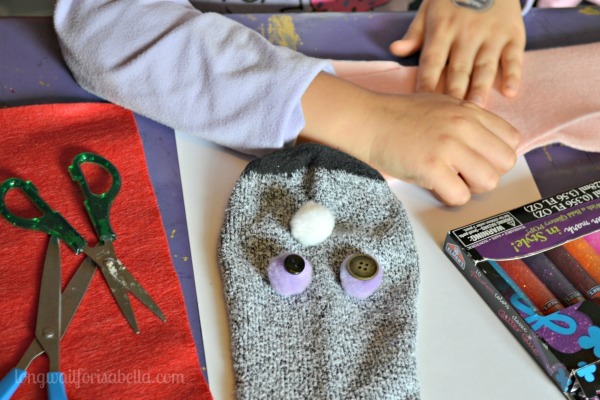 We got some inspiration for our sock puppets on Pinterest. We then compiled some of our craft supplies together. I also pulled out the hot glue gun. My Princess insisted that her sock puppet wear a pink dress. We used felt for that. 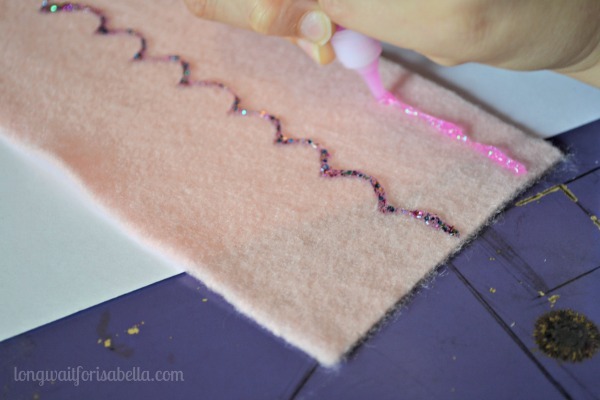 She decorated the felt with colorful glitter glue and a button. My Princess also wanted to give her puppet hair. So she cut strips of red felt. I did all the hot glue and added the hair on for her. I also attached her dress to the sock. We still need to figure out how we’d like to make the puppet’s mouth move easier. We might cut and use heavy card stock. For now, we are moving fingers alone for the mouth. 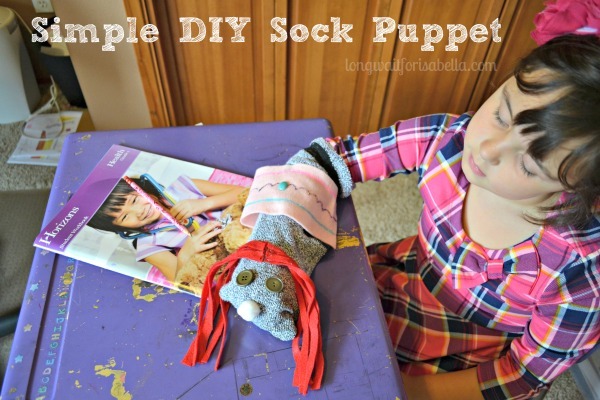 Anyone make their own sock puppet? What did you do for the mouth? For more sock puppet inspiration, here are a few more ideas. Let me know if you make one. I’d love to see how it turns out. 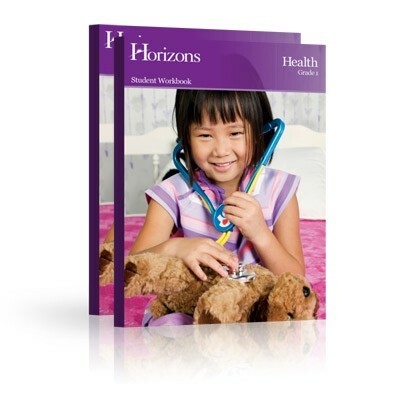 Teach your growing homeschooler the importance of health with Horizons 1st Grade Health Set! Including a teacher’s guide and student workbook, this complete set includes 50 step-by-step, age-appropriate lessons with suggested puppet dialogues and teaching materials, along with colorful student visuals and hands-on activities. The set covers Christian-based topics like changing bodies, healthy choices, health problems, and more! We’ve had three weeks of homeschool now, and have finished six health lessons from Horizons Health. I can honestly tell you that my daughter loves this class. She has learned about being unique and feelings plus much more in six lessons. Her favorite way to discuss the lessons are using sock puppets. Mine has not yet been decorated, so it is just a sock. But we talk back and forth with the puppets and she loves it. Health has quickly become in her top three for classes. We definitely recommend Horizons Health Set for 1st grade. Do your kids love Health class? Horizons is a brightly illustrated, engaging workbook curriculum from Alpha Omega Publications filled with consumable lessons and hands-on activities. Designed with fast-paced lessons, this Christian homeschool curriculum uses a spiral learning method to help your student master concepts through the process of introduction, review, and reinforcement. This learning method allows students to quickly grasp difficult concepts in a colorful, motivating format. Available in grades PreK-12, Horizons has a precise curriculum structure and six core subjects, plus the preschool course. Disclosure: I was sent the above curriculum this school year from AOP. All opinions are mine. I was not compensated for this post. 15+ DIY Thanksgiving Napkin Rings Simple and Frugal DIY Fall Decor DIY Dessert Server (Gone Wrong) 10 Great Valentine’s Day Crafts and DIY Ideas! This is such a cute idea! My grandson would love to make his own and be creative with it! These are so cute! I’ve made puppets before, and also wrote a play to go with the puppets! I know kids love puppets and putting on little shows with them – and it is fun for the grownups, too! That’s something we’ve never done with the kids. Need to plan to do that real soon! Those are so cute. My daughter would love to make these!